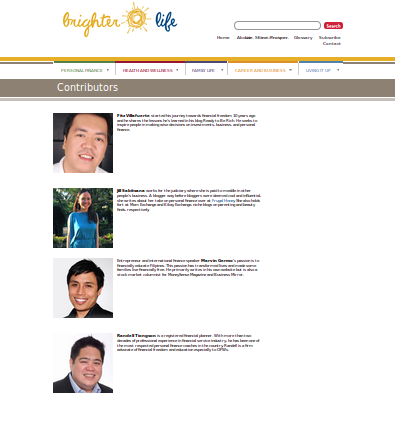 I couldn’t stop grinning like a ninny when I saw Brighter Life’s Contributors page, because I was on the same page with my local personal finance heroes! Fitz Villafuerte and Randell Tiongson have helped and educated so many Filipinos with their blogs and seminars, and they seem like genuinely nice guys as well. And I’m not just saying this because I’m a contributor, but I really do enjoy reading Brighter Life’s articles. I know the hard work that went into the site (Hi Tara!) and I’m happy that it all paid off in the end, resulting in an easy to navigate and interesting site that will definitely help a lot of people who want to know more about personal finance. I’m so glad that talking about money is no longer frowned upon. « I’m Part of Brighter Life! Congrats Jill! 🙂 Keep up the good work. We'll be waiting for your next articles.